Laser engraving on RFID Wristband Tag. We can engrave your logo or numbering you specify. We have a modern laser engraving and marking system designed to work directly on all types of tags and keyholders with an RFID Wristband Tag. STOP of scratch and sticking stickers on access control and work time attributes! Tagging and branding of the tags you use to control access to objects and devices can be done quickly, beautifully and at an extremely affordable price. Engraving ensures durability, precision to the smallest element. Images can not be copied or made by a standard printing method, which guarantees the uniqueness of each item. 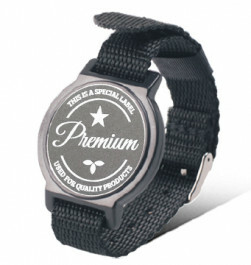 The likelihood of misuse and overlay of tags / chips is minimized by the use of laser engraving. We can engrave on a chip or tag you choose: number, logo, 2D and 3D barcode, protected characters or complex elements. When engraving, the laser destroys the surface of the tag, which guarantees the eternal drawing. For this purpose, you must send us a prepared vector file (curves) in some of the following file formats: .eps, .ai, .cdr. Fast terms and high quality.